Get Freak to the Fringe ! Leah and Georgie have important stories to tell. Help us get them to Camden and York's fringes !! THE HERD NEED YOUR HELP ! Iya!! We are the Herd, a group of students at the University of York with an interest in feminism and theatre. We want to take Freak, a play by Anna Jordan, up to the Yorkshire and Camden Fringes, and we need your help! Originally staged in the Drama Barn at the University of York in February, this is a production entirely run by students, and in order to get our show on the road, we need to raise some funds - so we are asking for any donations, no matter how small. wHAT'S ALL THIS FREAK MALARKY ABOUT???? Anna Jordan's Freak is a two-hander that explores female sexuality, self-image and sexual exploitation. Hilarious as it is heartbreaking, this piece is a bold examination of what it is to be a woman in Britain today. Stylistically the piece is confessional and immersive, with the characters telling their stories directly to the audience. For some vibrant, exciting and challenging feminist theatre, look no further! YH I GET YA ... BUT WHY SHOULD I PART WITH MY PENNIES? Good question. All in all Freak is a fantastic piece of new writing (first performed in 2014), and the story it tells, is one we feel both honoured and duty-bound to share with as many audiences as possible. It is an ideal piece for this year’s Fringes as is engages in the current media debate surrounding allegations of sexual assault, the #timesup campaign and of course the #metoo campaign. Freak adds a new standpoint to this debate as it doesn’t focus on the abuse women suffer at the hands of men, but on the abuse women suffer at the hands of themselves, in painful, hilarious and excruciating detail. It is so important to us to be able to tell these women's stories, as the issues they raise will be carried out of the theatre and into real-life discussion. If you donate to our project, you are ensuring these important stories are told, and helping us on our mission to spread awareness about the issues that effect all women, whether it be yourself, your sister, mate, girlfriend or Mum. We do not have the privilege of financial backing, or trust funds. So to get this story out there, we need your donations! OK. COOL. BUT WHERE IS MY MONEY ACTUALLY GOING? Venue hire : The Storrow, Cecil Sharp House, Camden / £400 (@ 100 per night) & York, The Basement /£105 (@ 35 per afternoon). Seriously cracking venues may we add. The Storrow is sick. Ellie's dad saw a gig there once. 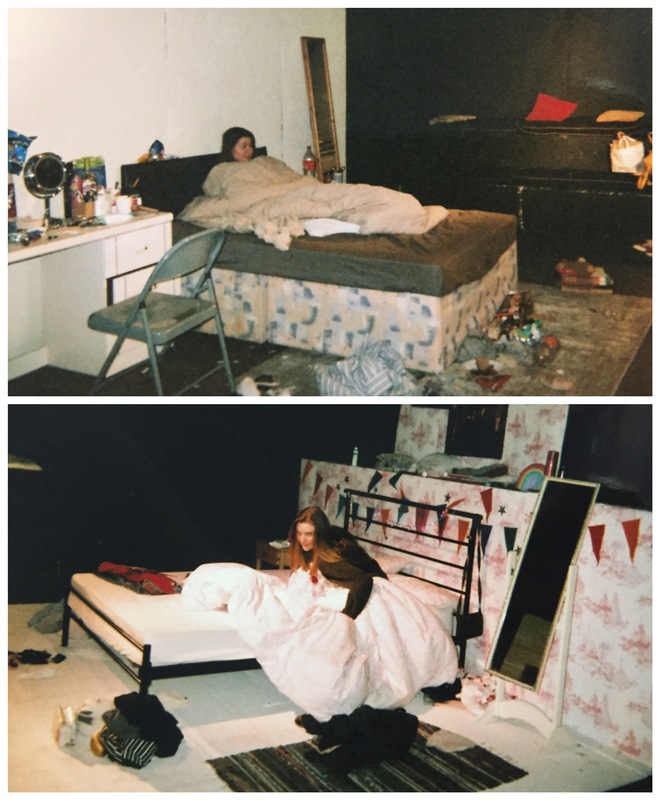 Set: £50 (£40 double bed and £10 for props - Fake cocaine, picture frames x1 and printed pictures). Yusu van hire to pick up bed: £100 (van hire and tank refill). We have set our minimum goal at £1236, as this would cover the venue hire, rights, and basic money for P&P. But as you can see, we really need to meet our maximum goal, otherwise essential fees will not be covered (Set, van hire, registration and insurance). So any donations, big or small, will be gladly welcomed!!! We are offering some fun rewards for all who donate! Do check them out! 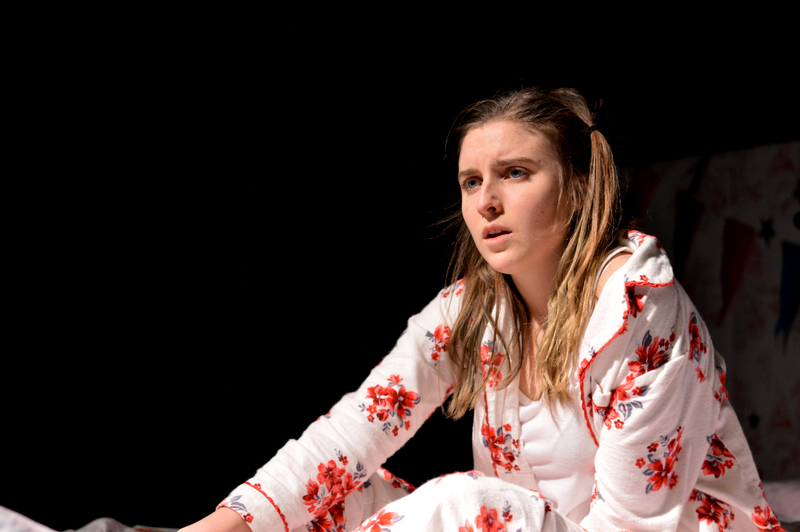 SOME PICS FROM OUR LAST RUN OF FREAK! Our marvellous set, designed by Sophie Shepherd. The only footage of the set that survived (Ellie is upset about this but happy she has these pics). Please follow us on our social media platforms for more updates on the show, as well as to see how our fundraising campaign is going !!! ALL THE THANK-YOUS EVERRRRRRRR with ten cherries on top !!! Thank-you so much if you have donated to our project, but if you have no spare pennies you can still help - by sharing our page with everyone you know, ever. Print it off, give copies to your bus driver, show your nan when you go round for Sunday lunch. Na but seriously, a simple sharing on Facebook will do our project the world of good! And if you do happen to have a spare fiver, we would be eternally grateful if you could sent it our way. Please sponsor us to help get this brilliant production to Camden and York's stages, and get these important stories told!!! Thank you so much! You will receive a personalised shoutout on our social media! Think of the glory of that Instagram story! Wowee! As well as a shoutout on our social media, you will receive an exclusive copy of the music we use for our preset, a remix of Freak by Estelle, featuring the cast and crew's own thoughts on everyday sexism! As well as a shoutout, and exclusive access to our Freak Remix, you will receive a personalised postcard signed by cast and crew expressing our gratitude for your donation! As well as receiving a shout out on our social media, a copy of our Freak remix and a personalised postcard, you will receive an exclusive signed copy of our poster! You will receive a shout out on our social media, receive our exclusive Freak remix, a signed postcard and poster, and we would also like to thank-you in our programme for your donation! You will receive a shout out on our social media, receive our exclusive Freak remix, a signed postcard and poster, and we would also like to thank-you in our programme for your donation! You will also receive two complimentary tickets to our show, either in Camden or York! You will receive a shout out on our social media, receive our exclusive Freak remix, a signed postcard and poster, and we would also like to thank-you in our programme for your donation! You will also receive four complimentary tickets to our show, either in Camden or York, and a bottle of bubbly after the show!